Holiday Bay Castle: Prestigious address for a privileged few. ‘Bay Castle’ is one of the most attractive lakefront apartments with a clear view of the beautiful lake in the city of Kochi and is a home worth spending your beautiful moments in. The captivating beauty of the backwaters with the serene surroundings make one fall in love with life at ‘Bay Castle’. 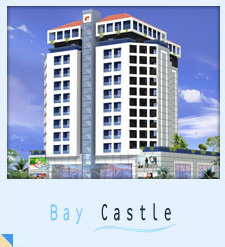 ‘Bay Castle’ offers the finest form of city living with all the world class amenities. ‘Bay castle’ has G+10 floors possessing 3 and 4 bedroom apartments and 2 floors of commercial space. Own your home at Bay Castle and live in the heart of Kochi- the queen of Arabian Sea. The amenities we provide at Bay Castle are swimming pool with kids pool and Jacuzzi, sauna, shower and change room, children’s play area, club house with multi-gym, elegant and spacious lobby with reception desk, Wi-Fi internet, cable T.V connection in each apartment, generator backup for common area and lift, generator backup for all apartments up to 2000 watts ( AC in one bedroom), special security system provision for camera to screen visitors, video conference intercom, maximum cross ventilation / natural lighting, covered car parking, provision for carwash, fire protection system, barbeque counter.